Enjoy flexible and affordable retreats with yoga, meditation, massages, life coaching and delicious vegetarian food. Did you ever wish that there was a way you could just go away and have some quality time for yourself to re-assess your priorities and start over? If yes and you are near the Byron Bay area or Gold Coast area (The Krishna Village is located half way between Byron Bay and the Gold Coast), our yoga retreat might just be that big break and fresh start you have been looking for. Why Do You Need A Yoga Health & Wellness Retreat Near Bryon Bay? Our modern way of living is incredibly rushed and packed with all sorts of activities, distractions, chores, work, and tasks that are waiting to be completed. This busy way of life can leave you feeling stressed, emotionally drained, spiritually fatigued and it can have a huge impact on your personality, relationships, and productivity. Hence, a yoga health retreat can be an ideal opportunity to heal and re-energise. Krishna Village is conveniently located only 30 minutes inland from the Pacific Highway and it is the perfect place to catch your breath, get your priorities straight, manage stress and come back to being the best version of you. Experience our joyous and simple ‘love life, live yoga’ lifestyle and learn how to navigate any challenge graciously and from a healthy, resourceful frame of mind. Skills development – Krishna Village gives you plenty of opportunities to develop your skills. Our organic farm is an ideal setting for learning about sustainable living and we offer a wide range of courses like yoga teacher training, massage courses, reiki courses, permaculture courses and much more. You can boost your personal skills and even add valuable certifications as a yoga teacher, massage practitioner or else to your CV. Personal development – If you’re in the Byron Bay area and you’re looking for a yoga retreat that’s supporting peoples’ personal development, you’ve just found the right place. We take you back to the basics of living and help you re-align with your core priorities. Through meditation, yoga and life coaching you can reconnect to who you truly are by learning how to truly relax your mind and spirit, further your personal growth on a spiritual level. Stress management – One of the best benefits of visiting a wellness retreat near Byron Bay or an even more scenic space in the gorgeous, less overcrowded hinterland, like Krishna Village, is that you will learn how to manage stress better. The whole Northern Rivers region, and especially the Tweed Shire with its impressive volcanic caldera and magical Mt. Warning are known for their natural beauty and special, healing energy. Make sure to enjoy beautiful day trips to the rainforests and beaches in the area. Along with our amazing massages, delicious food, inspiring classes and awesome crowd this might be just what you need to get rid of that build-up of stress and tension. Improved health – Yoga is a gentle yet superb full body workout. It is great for strengthening core muscles, boosting your posture, improving balance, deepening your breathing and for boosting flexibility all of which benefits your body and immune system. We also serve delicious vegetarian meals with ingredients that are sourced locally wherever possible, or grown right here in our own gardens. An ideal starting point if you are looking for a yoga retreat that helps improve overall health by supporting new, healthy habits. Weight management – Yoga, long walks, vegetarian meals and effective stress management will enable you to manage your body weight much better. With a balanced and healthy body weight, you will enjoy much more confidence, higher energy levels, and improved health. Learn about yoga and meditation – Yoga and meditation have incredible health benefits both on a physical and mental level, which will benefit you in the short and long run. Krishna Village is one of the best wellness retreats in the Byron Bay / Gold Coast area if you are looking for a yoga retreat that doesn’t only present these ancient practices as a fashionable exercise scheme, but as a holistic lifestyle that benefits body, mind and soul. Deepend your yoga practice and try out our meditation styles (kirtan and japa) which will enable you to stay in a joyous and stress-free frame of mind. Life coaching – Life coaching sessions are designed to help you find balance. You will be taken back to the basics and learn what your core needs and values are. We help you prioritise your life and lifestyle so you can regain control and start living the life you want and deserve. Book your stay – You can choose from single, twin, double and camping accommodations. Our retreat packages include daily yoga classes, yogic living classes, an optional temple program, daily kirtan meditation and three vegetarian meals a day. 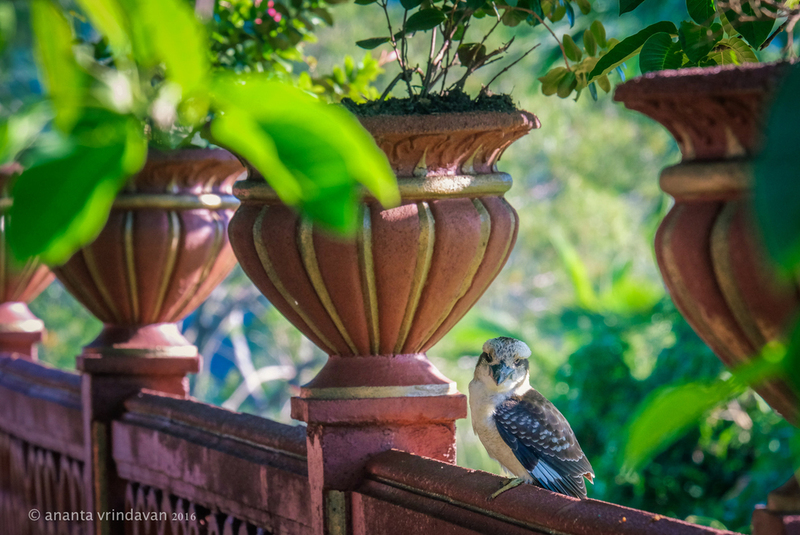 Enjoy our great retreat – The Krishna Village is often referred to as the Garden of Eden as it’s a haven for leading a simple, mindful, spiritually based lifestyle. Lots of different programs to choose from – While you are visiting our retreat you can take part in a variety of yoga and yoga lifestyle classes every day. You can also choose from additional wellness options such as life coaching, massages and reiki or enrol in professional programmes to further your life skills and become a yoga teacher, massage or reiki practitioner or permaculture designer. Have plenty of fun – Krishna Village is the best yoga retreat because there are so many fun things to do. 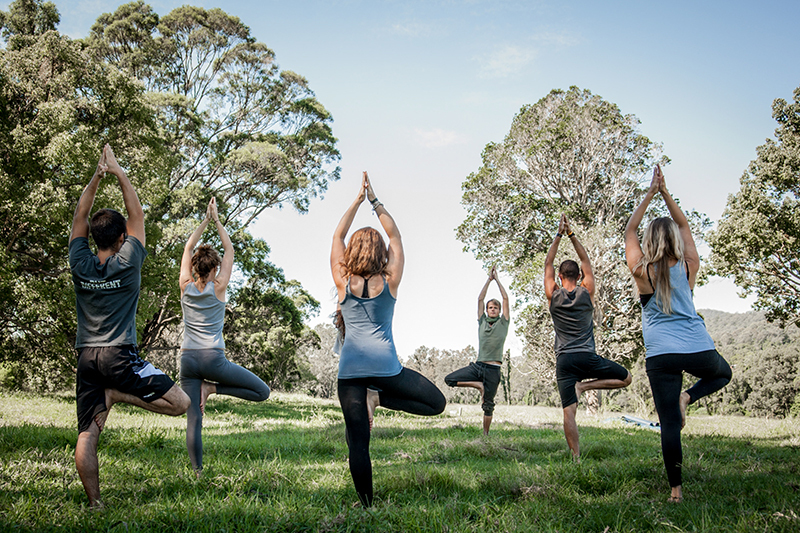 You can enjoy yoga sessions, get a massage, visit our organic farm, have a cuddle with our Sacred Cows and their calves, swim in the river, help us pick fruits and vegetables, sing along with us at the campfire, visit the beach, hike Mt Warning or visit Springbrook National Park. Get plenty of rest – All of the activities at our retreat are designed to relax and renew your spirit. There are plenty of opportunities for you to unwind and get plenty of rest. Return renewed and refreshed – When your stay at the retreat is over, you will feel completely renewed on a physical and spiritual level and can return home and get back to your normal life feeling fully recharged and revitalised. For more information about our relaxing activities, accommodation options, vegetarian food or about our yoga sessions feel free to contact us. We welcome anyone who is looking for a change so make your booking today and change your lifestyle for a better tomorrow. Embarking on a yoga retreat is a rewarding and potentially life-changing decision that will help you to learn new lessons and live a more fulfilling and healthy life. There are a series of steps that you can take to ensure that you get the most from your retreat. Here is a closer look. To get the most from your retreat experience, you will want to make sure that you are properly prepared. This means checking that you have everything you will need (including those items which are specific to your retreat as well as general and personal items) and that you are in the right mindset to get the most from the experience. Be sure to do some research and put yourself in the right frame of mind to get the most from your retreat. In fact, contact us if you would like our advice! We all have a lot going on in our everyday lives. It can be difficult to stop worrying about our work, our family, our finances and much more. These various concerns can keep us tied down and make it difficult for us to ever break free. Like quicksand, they can keep us stuck and stop us from moving forward. When it comes to yoga retreats, Australia residents will find that they have the incredible opportunity to truly disconnect for a short while and be present in what they are doing. Many people find that it is a life-changing experience to be truly present. Therefore, we recommend that you try to give everything your full attention. Upon doing so, our guests report that they experience a deeper appreciation for every meal, conversation, and moment. Just like preparing is key to enjoying any yoga retreats Australia has to offer, you should also be sure to set aside some time after your retreat to truly reflect on what you have learnt and experienced. Once you have some distance, you will be in a better position to reflect. Think about how you can apply the lessons your learned to make your everyday life more mindful, purposeful and conscious. Of course, you will want to make sure that you go on a reputable yoga retreat. By finding a trusted and well-rated yoga retreat, you can rest assured that you’ll have a positive experience. When looking for a suitable place, pay particular attention to reviews and testimonials from past visitors. By reading their stories, you will get a firsthand insight into what you can expect. Look into the quality of teaching and guidance, available facilities, peoples’ personal experience at the retreat. We have a wide range of reviews available for you to read, and we hope that these will give you a vivid and accurate idea of what you can expect when visiting Krishna Village. If you are curious, visit our beautiful Radha Govardhandhari temple and learn about the spiritual foundations of our 'simple living, high thinking' philosophy. As a permanent eco yoga community, we provide classes ongoingly for all guests, taught by a variety of teachers. The recommended arrival day is Monday, when we run an 11am Welcome Tour for all new arrivals and introduce you to our yoga program, our vision, our Radha Govardhandari temple and our way of life. To get a general idea about our program, please have a look at our activities overview. At the moment we are running yoga classes 2x/day (early morning and afternoon) as well as Yogic Living classes on Sun-Fri at 2pm, which encompass a broad variety of topics around a healthy yoga lifestyle, like philosophy, meditation, ayurveda, life coaching etc.. Many of them are the 'best of' parts of our Yoga Teacher Training curriculum, made available for all guests - like on this example schedule. You can come and join us for a month, a week, or just a few days. Kids are most welcome, but need to be supervised by their parents at all times. To see if this experience is for you, please read our FAQ for retreat guests and our Code of Conduct. If you are dealing with any physical or mental health issues, please also check our Are you ready page to make sure this is a suitable experience for you. When it comes to our yoga classes, we have a variety of in-house teachers and guest facilitators to keep our schedule interesting and varied. In addition, some classes are taught by our yoga teacher trainees, and by travelling yogis who hold appropriate certifications. The Krishna Village offers single, double and twin share rooms as well as camping spots for up to about 75 people. All rooms have shared amenities. The amenities block includes showers, toilets and a coin operated laundry (byo laundry powder). All rates include 3 meals/day and all yoga and other classes. 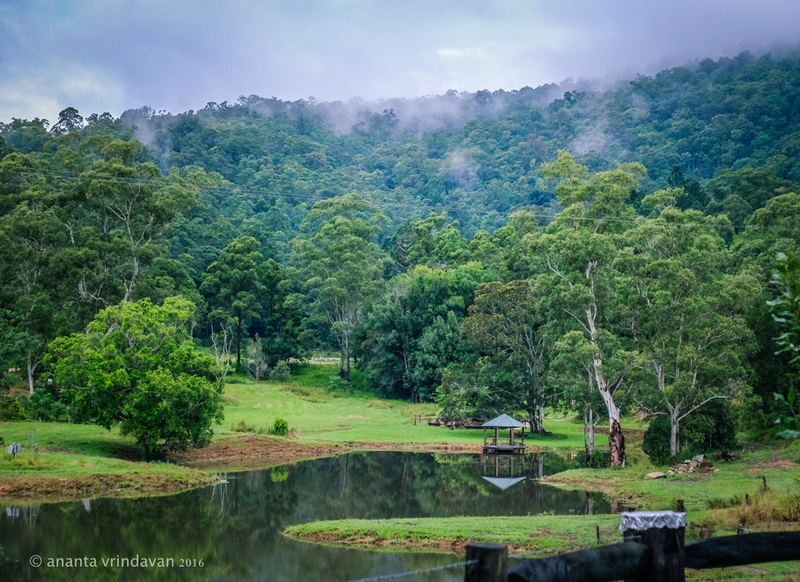 Nestled in the foothills of Mount Warning, in the heart of the Northern Rivers of New South Wales, the Hare Krishna Farm “New Govardhana” is a 1000 acre certified organic property with orchards, veggie gardens, cows, horses, streams and swimming holes in abundance. 1) 1) Before you book, please read our terms and conditions including our refund policy.